Learning a new language can be difficult. It’s a whole new set of vocabulary, grammar, and cultures to learn. There are a variety of tools that can help the process. We can’t teach you a whole new language, but we can help you find some tools that hopefully make the process easier. Here are the best language learning apps for Android! Check out the bottom of the article for a complete list of our language learning apps for specific languages! We also have a massive list of translator apps that you can find by clicking here! Here are some more educational apps for your consideration! 50Languages is a developer on Google Play with a ton of language learning apps. In fact, 50 languages isn’t a misnomer. You can learn dozens of languages with the official app. Additionally, the developers have individual apps for most of its languages. It teaches basic sentences and vocabulary. The UI is good enough and it functioned fine during our testing. It’s a good starting place for frequent travelers or those looking to start a language. It’s also relatively inexpensive compared to most other apps like these. Duolingo made a big splash. Its central premise is that language learning should be free. Thus, all of the languages it supports is available for free from beginning to end. It uses a gaming concept where you learn new languages by playing little games that shows you new vocabulary and grammar. It doesn’t sound that serious, but the developers boast that 34 hours of playing is about equal to a semester in college. It’s a great place to start for beginners on a budget. It’s definitely one of the must-try language learning apps. Google Translate is an excellent tool. As the name implies, the app translates a variety of languages into other languages. It has support for dozens of them. It’s a great way to check and see what words mean in other languages. Additionally, the app includes a camera feature that lets you translate words by pointing your camera at them. You can even talk to the app and it’ll translate the words for you. It’s a powerful app that’s meant for travelers, but it can be used by those learning languages too. It’s worth picking up. Language Drops is a developer on Google Play with a bunch of language learning apps. Each language has its own app and the developer supports dozens of languages. Some are rather difficult to find in other apps. Drops uses a simply philosophy. It focuses heavily on vocabulary with almost no focus on grammar. Thus, you learn conversational language and vocabulary quickly with grammar just kind of filling itself in as you go. This is also one of the few language apps with a single price, even if it is kind of expensive. Memrise is one of the most popular and powerful language learning apps. The app comes with both a free and a pro version (subscription). The free version offers some basic lessons. That gives you a chance to try it out. The pro version is a subscription that also opens up all of the other lessons. The app has a variety of lesson types, including games, memorization, vocabulary and grammar, and even a social community learning element. The app supports dozens of languages as well, including some that are usually difficult to find. Check out more awesome apps! Mondly is another large language learning platform. It supports almost three dozen languages. This platform focuses a lot on conversational learning instead of repetitive vocabulary stuff. You learn how to talk to people first, and then you learn how to actually talk in the language. Additionally, it comes with decent speech recognition for vocal practice, a phrasebook, and Google ARCore support. It’s a tad expensive, but only slightly more so than Memrise and other competitors. MosaLingua Crea is a developer on Google Play with a bunch of language learning apps. It uses a flashcard system. The premium version of the apps cost $4.99 and come with over 3,000 flashcards. It’s an excellent study aid. We might not recommend this as a primary language learning source. 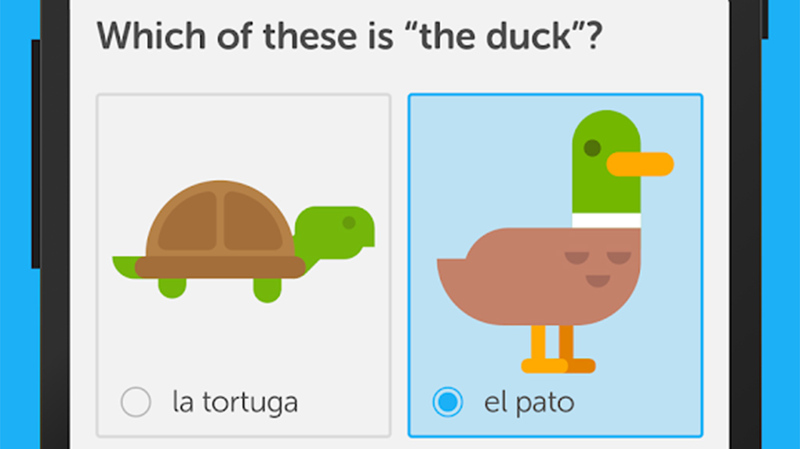 However, this with something like Duolingo make for a good one-two punch. These are among the most comprehensive flashcard apps for languages. Quizlet can be a valuable tool for those learning a new language. It doesn’t teach anything on its own. However, you can use it to help you memorize new information. It’s essentially a glorified flashcards app with more features. Along with flashcards, you can create quizzes and games to test your skills. You can even include image and video elements if you want to. This is an excellent choice when accompanied with other language learning apps. You can download it for free to check it out if you’re interested. Rosetta Stone is one of the most popular language learning apps. Its been around for decades at this point. The central app supports about two dozen languages in total. It includes Rosetta Stone’s learning methods which are similar to Mondly’s. It focuses a lot on conversational learning with added grammar and vocabulary lessons. It’s a tried and true method. However, it’s also a very expensive method. There are monthly and yearly subscriptions available. There is also a single cost variant that is fairly expensive even for a language app. Tandem and HelloTalk are two very unique language learning apps. They rely almost entirely on community input. You pair up with another individual. They teach you the languages that they know and you teach them the languages you know. The app pairs two people together based on what languages they want to learn. The apps both feature well over 100 langauges, video and voice calls, text messages, picture messages, and audio messages. Both of them are very good at what they do. The better one will depend on your personal preferences. Here are some more tools to help you learn! Thanks for reading! If we missed any of the best language learning apps for Android, tell us about them in the comments! To see our complete list of best app lists, click here.